Three is truly the magic number for Asda as it scooped the title of Retailer of the Year at the 2012 British Turkey Awards for the third year in a row. Judges declared Asda the winner for its extensive range of everyday turkey portions, which judges said would suit all kinds of consumer – from small households to families and convenience shoppers. Asda is Turkey Retailer of the Year. Pictured are L-R: Matthew Pinsent (Olympic Gold Medallist), Nicola Rye (Bernard Matthews), Catriona Lee (Cranberry Foods). Chris Gilbert (Asda). Andy Wilson (Asda), Matthew Evans (Elanco), Elaine Robinson (Asda), Pete Scrivener (Ex London Wasps Rugby Player). All supermarkets stocked a good range of breast fillets, mince, diced thigh and turkey steaks, but the independent panel of judges commended Asda for their “fantastic range to suit all seasons” which included barbecue options such as burgers and sausages, as well as innovative meal solutions such as meatballs. 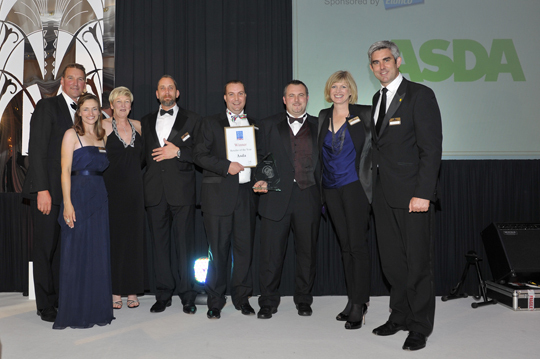 Asda was handed the Retailer of the Year trophy by ex London Wasps rugby star Pete Scrivener, and Nicola Rye, chair of the British Turkey Federation’s Publicity & Marketing Committee, in front of more than 240 guests and VIPs at The Savoy, London. Former Olympic rowing champion Sir Matthew Pinsent hosted the awards. Winners of the 10 categories were announced from 79 entries, ranging from Coronation turkey breast chunks, a turkey wellington and chilli turkey burgers to fourteen different whole roasted turkeys. The Christmas category was split into three sections – Best Premium, Best Traditional and Best Convenience. Jimmy’s Farmers Range – Free Range Rustic Bronze Turkey, the brand by Suffolk based farmer and television presenter Jimmy Doherty won the Best Premium category, which judges praised for its “majestic appearance, stand-out texture and moreish taste”. The award for the Best Traditional category was scooped by Asda for its Basted Whole Turkey, for its “delicious moist and buttery flavour”, and the Best Christmas Convenience went to Jamie Oliver’s My Tastiest Turkey Box – two stuffed leg and breast joints which come with a gravy. The judges loved the homemade taste of the stuffing and the rich, dark meat. The evening also raised more than £14,000 for the children’s medical charity Sparks, and Dravet Syndrome UK.